Rooftops of houses and offices in Gujarat’s capital Gandhinagar got a makeover last year. Over 280 houses and private buildings, and 50 government offices were fitted with solar panels. More are being added. The installed panels are together feeding 4.6 MW of electricity into power grid every day. The energy generated is enough to power around 1,000 households with an average load of 5 kWh. Gujarat has adopted the gross metering model of rooftop solar generation in which the entire solar power generated is directly fed into the grid. A meter records the solar energy generated. The project developers, Azure SunEnergy India Ltd and SunEdison, are getting a tariff of around Rs 11 per unit. The tariff is higher than conventional power tariff and is called feed-in-tariff (FiT), which is given to promote renewable energy. Torrent Power, the distribution company (DISCOM) serving Gandhinagar, buys the clean energy and fulfils its renewable purchase obligation (RPO), a requirement that every state has to meet by buying a certain percentage of renewable energy every year. This arrangement will continue for 25 years, and the tariff will remain fixed. The 5 MW project is a pilot by Gujarat government to demonstrate the functioning of rooftop solar power system. While Gujarat has been able to execute the rooftop solar power project, such examples are few in India. Financial hurdles, coupled with policy and technical glitches, are hindering the adoption of rooftop solar power projects in the country. India has been rooting for solar power for a while now, but grid-connected rooftop solar power generation is in its infancy in the country. This is primarily because the government, till very recently, was only focussing on ground- mounted solar projects, which are not feasible in the long run as land is scarce. Approximately two hectares of land is required for 1 MW solar power plant. Over 98 per cent of the 2,700 MW grid-connected solar power installed capacity generated under the Jawaharlal Nehru National Solar Mission (JNNSM) has been through ground-installed solar projects. JNNSM was launched in 2010 under the National Action Plan on Climate Change. In the Rooftop Photovoltaic and Small Scale Solar Generation Program launched under JNNSM to promote rooftop projects as well, nearly all of the installed 90 MW capacity is ground mounted because there was little clarity over installation rooftop solar projects. The programme is over now. 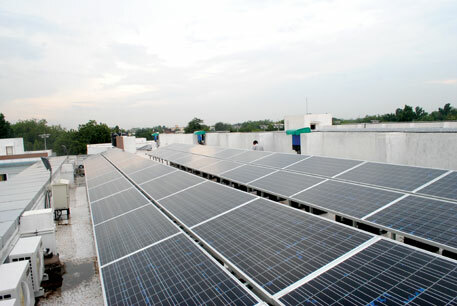 In 2012, the Ministry of New and Renewable Energy (MNRE) launched a pilot scheme to study grid-connected rooftop solar power in India. The scheme has sanctioned rooftop projects with a total capacity of 26 MW and has so far completed projects with a total capacity of 3 MW. The Solar Energy Corporation of India (SECI), the nodal agency for the scheme, has released a tender for another 50 MW in March this year. The last two years have also seen around eight state governments release rooftop solar power policies with net-metering, which allows self-consumption of solar power (see ‘Net-metering rooftop solar projects’). Other states are likely to follow. The total capacity targeted under these state policies is around 700 MW which is expected to be installed in the next five years. Though no clear estimates are available on the potential of rooftop solar power in the country, one can get an idea from an analysis done to estimate rooftop solar power potential in Delhi. The capital has over 31 sq km of rooftop space that can be used for solar projects, says a report jointly prepared by Greenpeace India and Delhi-based solar power consultant Bridge To India. The report, Rooftop Revolution: Unleashing Delhi’s Solar Potential, says 2,557 MW of solar power can be generated on Delhi rooftops alone, which, experts say, is enough to offset 45 per cent of Delhi’s current peak power demand. “Several cities and towns in the country are experiencing growth in their peak electricity demand, which DISCOMS are finding difficult to meet. The deficit is at times is met through diesel gensets,” says Ashwin Gambhir, policy researcher with Prayas energy, a non-profit in Pune. “This peak can be substantially offset by generating solar power on rooftops.” Solar power generation is also cheaper (Rs 8-9 per unit) than diesel power (Rs 18-25 per unit). Another advantage of grid-connected rooftop solar projects is that the power generated is usually consumed locally which reduces transmission and distribution losses. In the case of centralised projects, close to 30 per cent power gets wasted during transmission over long distances. 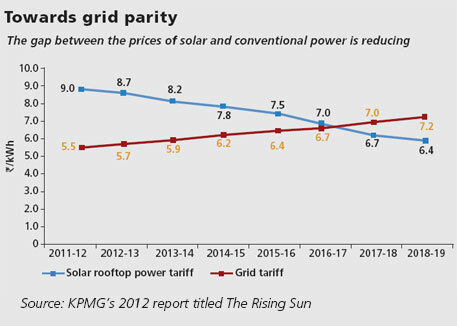 Renewable energy experts say that generating power on rooftop is making economic sense with the price of solar panels falling and consumer tariffs rising (see ‘Towards grid parity’). “Both are going to equalise soon and solar power will no longer be seen as an expensive option,” says Jasmeet Khuran of Bridge To India. The model, which is popular in the United States, suggests electricity generated by a rooftop project will be first consumed by the rooftop owner and only the surplus generation will be transferred to the grid. The model requires a bi-directional meter to record both inflow and outflow of electricity. At the end of the billing period, solar power fed into the grid is deducted from the grid power supplied to the consumer. The remaining ‘net’ consumption is charged at normal tariff slabs. Renewable energy experts believe the model can be successful in India where most discoms are reeling under losses. High upfront cost of installing the rooftop solar system has been the biggest hurdle in its adoption. 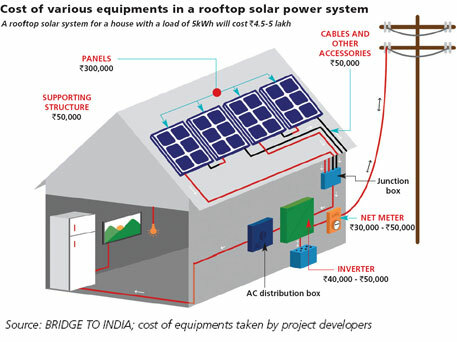 It costs around Rs 1 lakh for 1 kW solar power system (see ‘Cost of various equipments in a rooftop solar power system’). “Despite a sharp fall in the cost of solar panels, the price of putting up the entire system in place is still expensive, especially for households,” says a senior MNRE official. The ministry is providing a 30 per cent subsidy on setting up solar projects to offset the financial burden. Some state governments are providing additional subsidy to lessen the consumer’s burden. For example, Tamil Nadu, which plans to have 10,000 grid-connected solar rooftops for domestic consumers, has announced a subsidy of Rs 20,000 per kW. The combined subsidies will reduces the cost by 50 per cent. The subsidies, however, have become a hurdle because of delays in disbursement. “Subsidy of around Rs 4 crore for our approved projects is lying with the MNRE since last year,” says Manu Karan, who heads the rooftop solar business for SunEdison Ltd. “This is delaying the installations because the ministry says that unless subsidies are cleared, we are not allowed to go ahead with installations,” adds Karan. Official sources in MNRE say subsidies for solar projects have not been released since last year because the ministry is facing cash crunch. “We will take a decision soon,” says a senior MNRE official. Renewable energy policy analysts believe subsidy for rooftop solar projects is not needed. “The commercial and industrial customers in some states (such as Maharashtra) are already paying tariffs comparable to or higher than solar power costs. So, what is needed is a facilitating framework of net metering and not subsidies,” says Gambhir. Hemant Bhatnagar, technical expert with GIZ, the German agency for promoting sustainable development projects, says, “In some states, even government buildings are paying a tariff of Rs 7-8 per unit. 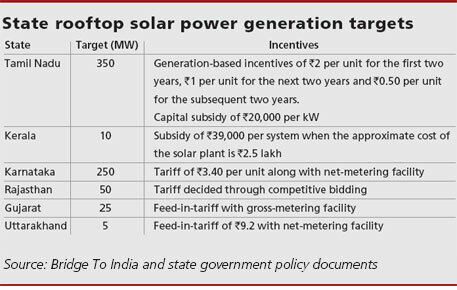 If they install rooftop solar system, the levelized tariff for 25 years would come around Rs 9 per unit. Given the way grid tariffs are rising, grid parity would reach in the next two to three years.” GIZ is helping state governments devise solar rooftop policies. “The government should instead give generation-based incentive, which is extra remuneration on per unit of energy generated. It can be gradually reduced as grid parity approaches,” says Bhatnagar. Tamil Nadu, for example, plans to give an incentive of Rs 2 per unit for the first two years, Rs 1 per unit for the next two years and 50 paise per unit for the subsequent two years to attract domestic customers. Renewable energy experts say that there are other models available in the market to take the financial burden off customers. One such model is Renewable Energy Service Company (RESCO) in which a third party, generally a renewable energy company, gets into an agreement with a rooftop owner. The company invests in the system and sells power to the consumer at a tariff lower than the grid tariff for 20-25 years. Operation and maintenance is the responsibility of the company. The rooftop owner gets to save on power consumed from the grid. The developer, on the other hand, recovers cost by selling power and also claims various tax benefits. “Initially, this arrangement is more suitable for commercial and industrial customers who are already paying grid tariffs higher than residential and government consumers. 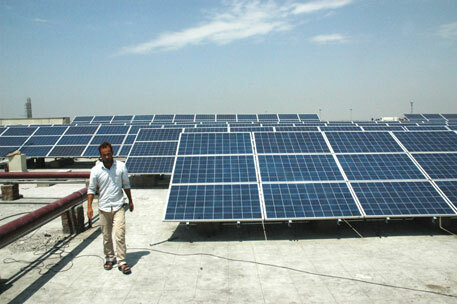 Households may have to wait for some more years for solar tariff to fall further,” says Khurana. There are other concerns with the RESCO model, including credit worthiness of the power purchaser. “What if the rooftop owner sells the building and the new owner doesn’t want the roof to be utilised for solar power generation. Shifting the entire system would involve significant cost,” Khurana says. Rooftop solar projects have also failed to pick up because financial institutions have been reluctant to give loans. “Banks don’t find these projects bankable because of lack of experience in this sector. They are also apprehensive because most state DISCOMS are debt-ridden and are unlikely to pay the premium for clean energy,” says a developer. According to Ministry of Power, DISCOMS across the country have a debt of Rs 1.9 lakh crore in 2012. “Renewable energy should be made a priority lending sector for banks,” says Pankaj Verma, GM, solar marketing, Jakson engineers Ltd, a Noida-based solar project developer. A senior MNRE official says the ministry has had many rounds of discussions with banks on the matter but in vain. “Many Indian banks are finding it difficult to lend to even conventional power sector due to its bad state, forget lending to renewable projects,” says the official. “There are not enough successful projects or business models either to earn lenders’ confidence,” says a senior official of the Indian Renewable Energy Development Agency, which finances renewable energy projects. Big commercial banks, on the other hand, say rooftop solar projects are unprofitable because of the small project size. “Most commercial banks do not deal in projects lesser than Rs 100 crore,” says an official with a leading commercial bank. A developer suggests that one way to gain confidence of the banks is to allow the developers to sell power to multiple customers, including DISCOMs. “So even if one defaults, there is payment security form others. The government is yet to think in this direction,” he says. Project developers say DISCOMs fear that rooftop solar projects will reduce the consumption levels of their existing customers, who will start generating electricity. DISCOMs deny this. “The rooftop solar policies are not clear on many technical grounds. States have released policies but there is little clarity of how to implement them,” says an official of Tamil Nadu Generation and Distribution Corporation Limited. Policy analysts say DISCOMs would not be interested unless they are penalised for not fulfiling RPO. The other problem is the lack of coordination in policy making between MNRE, state nodal agencies and DISCOMS, says Verma. There is also a debate over the size of the rooftop system in some state policies. For example, the draft of net-metering released by Delhi Electricity Regulatory Commission (DERC) in November 2013 says the capacity of an individual rooftop system should be same as that of the sanctioned load of the consumer given through the service line connection. Abhishek Pratap, campaigner with Greenpeace India, says, “If the capacity is limited to the sanctioned load, then, in practical sense, it is more about self-consumption and nothing can be fed into the grid.” Pratap has petitioned DERC to amend this provision to the capacity allowed by consumer’s rooftop. Another point of contention is the cumulative capacity of solar installations in the service area of a transformer. If the penetration of solar power exceeds a certain limit, balancing the grid can be a problem. DERC and Forum Of Regulators, a group of consultants on energy, have proposed that the cumulative capacity of solar installations should be limited to 15 per cent load in a transformer to avoid technical issues. This has drawn flak from project developers who say that instead of restricting the growth of solar power, local grid infrastructure should be overhauled to take care of the excess generation. “The 15 per cent suggested by DERC (and 30 per cent by Tamil Nadu and 50 per cent by Kerala) is a reasonable number to start with. Until this limit is reached, utilities should allow rooftop projects on a first-come-first-serve basis without any studies. Only after this limit is reached should some studies be conducted to understand whether any tweaks are needed in the system to increase rooftop penetration. In many cases, significantly higher rooftop penetrations may be possible without any additional infrastructure,” he adds. How come the date of the report is May 15, 2014? It's from Down To Earth print edition of May 1-15, 2014. Land is one of the biggest problem for Solar Power generation. Can you please enlighten whether floating solar panels on the sea is fesable for coastal cities ? Excellent article. I fully endorse the views as a Renewable Energy Expert. 3) There are no qualified technicians to take care of the difficulties arising during the operation of the same, hence while promoting rooftop systems parallely there should be stress on skill development to ensure there are required number of technicians to tackle various bottle necks. Why canal based solar projects? To construct on the canal the panels is costly and also to reach them difficult (for O & M). Is there no land to put up solar Projects in Gujarat? The present efficiency of solar cells is very low(about 15%). It is expected in couple of years more efficient solar cells will be in the market. Can’t we wait for couple of years? With the present investment in solar projects we can have more cheap and efficient systems in the future. On the other hand with half of the investment (what has been invested in Solar PV) Wind Farms can be set up whose efficiency is around 35%. Wind Turbines (of MW size) can be erected in a month. It is all public money that goes into solar projects and it should be spent judiciously and wisely. How can PV panels put on the canal generate 15% more energy than on land? As I mentioned in my comments the present solar PV efficiency is hardly 15%. Common sense tells me the temperature in the air around the canal length is less compared to outside the canal. This means solar insolation temperature will be less on the panels mounted on the canal. It was claimed ‘Significant amount of water is saved from loss due to evaporation under direct sun. Mounted panels provide shade.’ What is the length of the Canal and to what area the Solar Panels were covered? Such sweeping comments are for politicians which have no scientific background. In fact there is a joke about Solar Cell: The Amount of energy that goes into the production of solar cell is more than the output it gives in its life time! The material that goes into solar panels aluminium, steel,glass etc. are all energy intensive. No body is against solar energy. In fact the coming age is all Renewable energy. Solar Water Heaters, Solar Cookers, Solar driers, Solar Reading Lights with LED etc. will be a boon for developing countries. Solar Cooker (Box Type) which is more than 60 years old is yet to penetrate in rural areas. Hardly 6 lakh Box Type Solar Cookers are sold (but not used) in the country. In the power generation there must be comparison of cost between conventional power and Renewable Energy and between various Renewable Energy options like solar, wind, biomass, mini and micro hydel etc. If the contention is that Sunlight is available in most parts of the country for a long time in a year, there are other options like biofuel and conversion of biogas into power. Agave is a care Ã”Ã‡Ã´ free growth plant which can be grown in millions of hectares of waste land and which produces Biofuel. Already Mexico is using it. Another Care free growth plant is Opuntia which generates Biogas. Biogas can be input to generate power through Biogas Generators. Biogas generators of MW size are available from China. Yet another option is Water Hyacinth for biogas. Water Hyacinth along with animal dung can produce biogas on a large scale and then power. In Kolleru lake in Godavari and Krishna Delta in Andhra Pradesh it is available in 308 Sq. Km for nearly 8 months in a year. Crassulacean acid metabolism, also known as CAM photosynthesis, is a carbon fixationpathway that evolved in some plants as an adaptation to arid conditions In a plant using full CAM, the stomata in the leaves remain shut during the day to reduce evapotranspiration, but open at night to collect carbon dioxide (CO2). The CO2 is stored as the four-carbon acidmalate, and then used during photosynthesis during the day. The pre-collected CO2 is concentrated around the enzyme RuBisCO, increasing photosynthetic efficiency. Agave and Opuntia are the best CAM Plants. What is needed in an agrarian country like ours is AGRO INDUSTRIES to utilise local resources and resourcefulness as advocated by Mahatma Gandhiji. Solar panels have to be mounted facing south to harness more energy. Can the canals (already existing) are all south faced? Instead of big solar projects, roof top solar makes sense in India in view of high rise buildings coming up even in towns.